What makes the E60 M5 sedan and E61 M5 Touring unique? The E60 M5 sedan and E61 M5 Touring are high-performance versions of the E60 5 Series sedan and E61 5 Series Touring that were engineered by BMW M GmbH (an independent subsidiary of BMW AG). Both are powered by an M-designed 5.0-liter V10 powerplant and are equipped with many special enhancements to the chassis, as well as unique interior and exterior components. 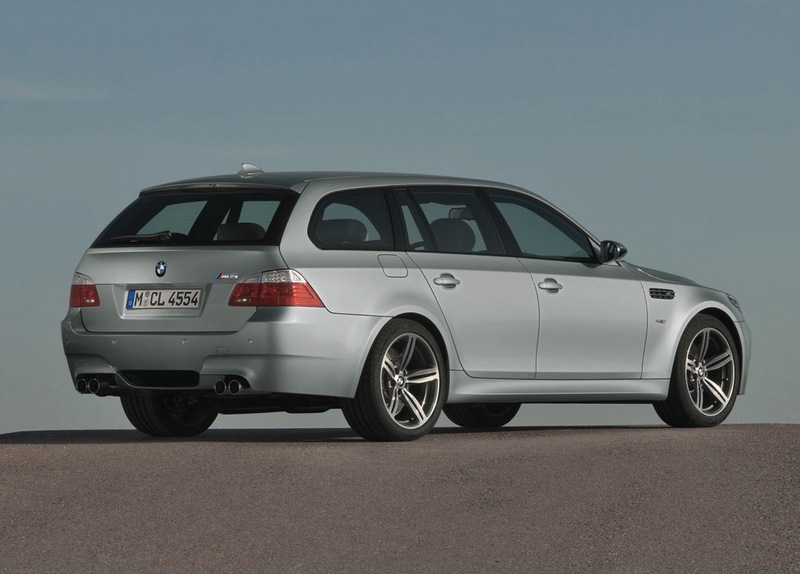 Where were the E60 M5 sedan and E61 M5 Touring first introduced? 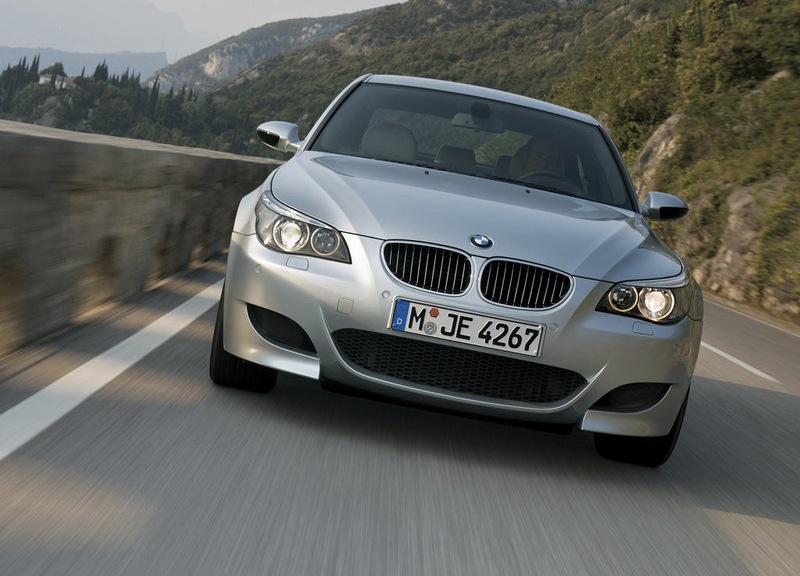 The E60 M5 sedan debuted in concept form at the 2004 Geneva International Motor Show. However, the production version was not officially unveiled until the Paris "Mondial de L'Automobile" in September of 2004. The E61 M5 Touring debuted three years later at the 2007 Geneva International Motor Show. Where were the E60 M5 sedan and E61 M5 Touring produced? 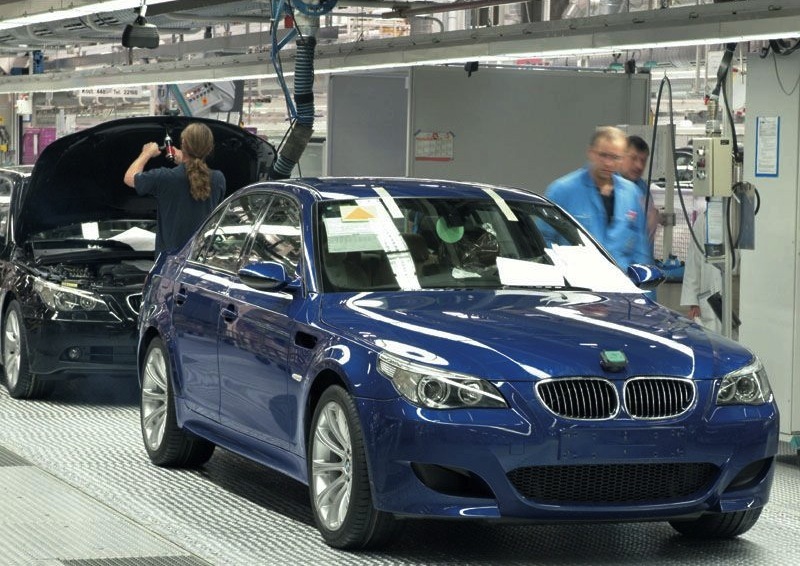 Both the E60 M5 sedan and E61 M5 Touring were built on the standard 5 Series production line at BMW's Dingolfing factory north-east of Munich. How many official versions of the E60 M5 sedan and E61 M5 Touring were offered? BMW offered three different versions of the E60 M5 sedan: European-market models in both left-hand drive (NB91) and right-hand drive (NB92), which were sold in all worldwide markets outside of North America, plus a North American-market version (NB93) in left-hand drive only. In addition, the E61 M5 Touring was offered in both left-hand drive (PV91) and right-hand drive (PV92) models, but was only built to ECE specification. How many examples of the E60 M5 sedan and E61 M5 Touring were produced? How many examples of the E60 M5 sedan were produced with a manual transmission? BMW M produced a total of 1,364 examples (including six pre-production vehicles) of the E60 M5 sedan with the optional 6-speed manual gearbox, all exclusively for the USA and Canada. What significant changes were made to the E60 M5 sedan and E61 M5 Touring during their production? 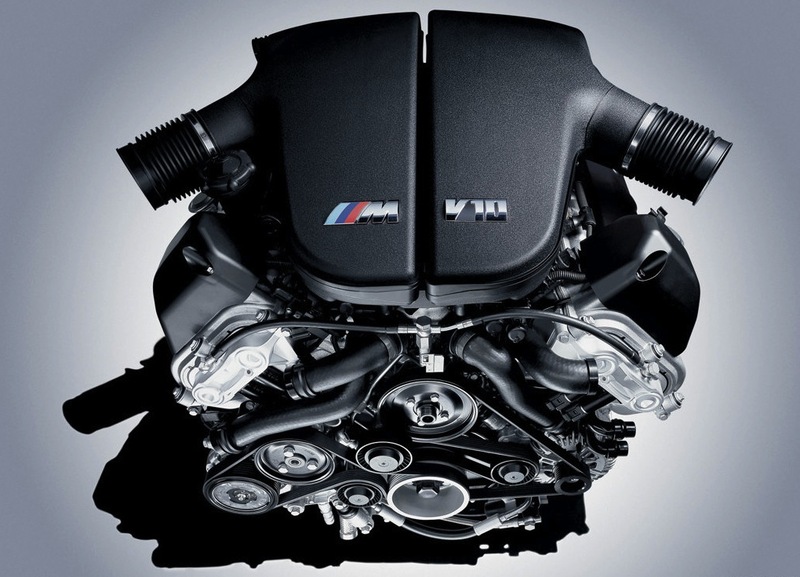 What are the characteristics and specifications of the M5's V10 engine? The M5's V10 powerplant carries the internal designation S85 B50 and was developed by BMW M specifically for the E60/E61 M5 and E63/E64 M6. 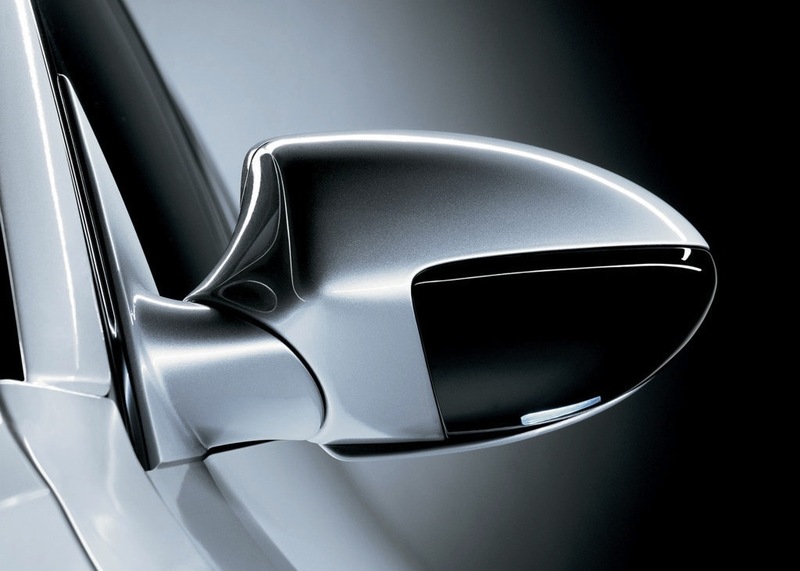 It is a "clean sheet" design that shares no components in common with earlier motors from BMW M or BMW AG. The decision to switch to a V10 was obviously influenced by BMW M's V10-powered efforts in Formula 1 racing, though it has also been described by BMW's head of engine development as being the outcome of a BMW M's desire for a 5.0-liter motor where each cylinder displaces 500cc. What transmissions were offered on the E60 M5 sedan and E61 M5 Touring? 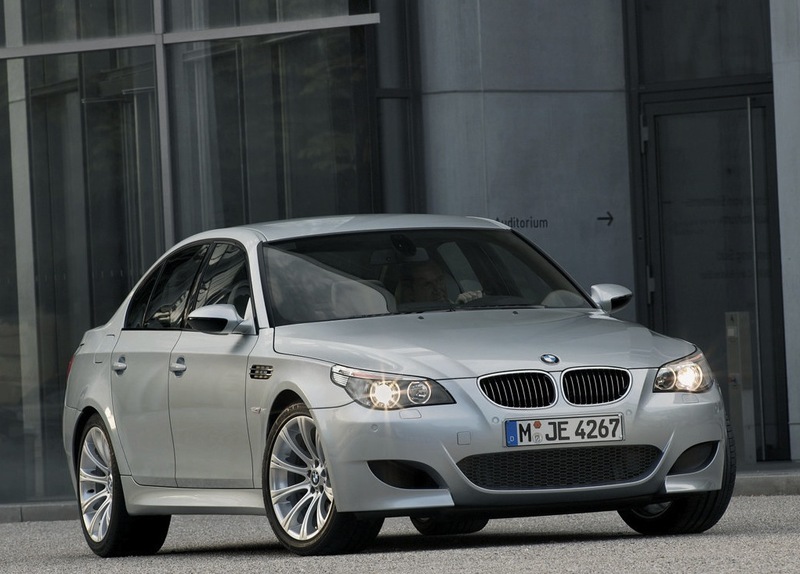 The majority of E60 M5 sedans and all E61 M5 Tourings were equipped with a third-generation Sequential M Gearbox (SMG III) with a single clutch, 11 DRIVELOGIC shift programs (5 in automatic mode, 6 in manual mode) and launch control. Unlike earlier SMG systems used in the E36 M3 (SMG I) and E46 M3 (SMG II), the 7-speed SMG III was developed from scratch to work in concert with the S85 motor and was not adapted from an existing manual gearbox. It is capable of shift times that are 20 percent faster than those of the earlier SMG II transmission. Gear ratios for the SMG III are as follows: 3.99 (1), 2.65 (2), 1.81 (3), 1.39 (4), 1.16 (5), 1.00 (6), 0.83 (7). The final drive ratio is 3.62:1. Due to market pressure from North American customers, BMW introduced a manual transmission option for E60 M5 sedans sold in the United States and Canada beginning with September, 2006 production. 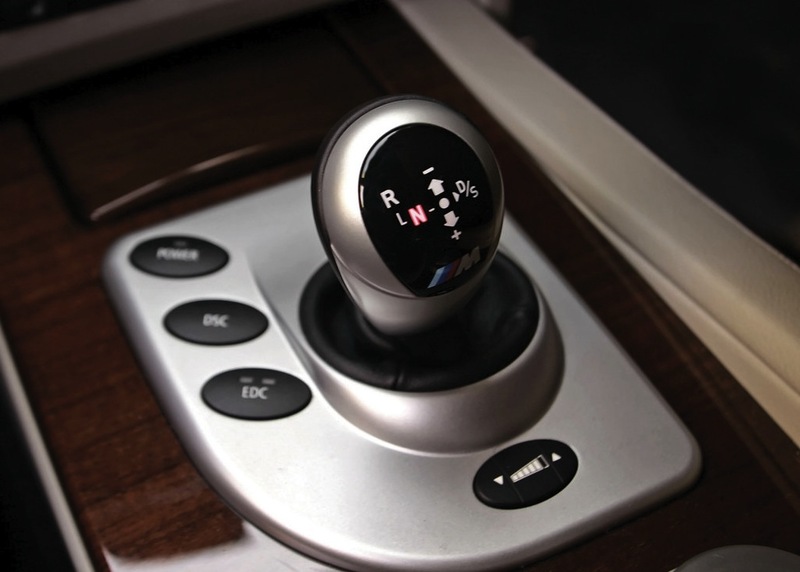 The ZF Type G 6-speed manual gearbox was shared with the E60 550i and carried over to the E60 M5 with the same internal ratios: 4.05 (1), 2.40 (2), 1.58 (3), 1.19 (4), 1.00 (5), 0.87 (6). However, it retained the significantly shorter 3.62:1 final drive from the SMG-equipped M5. 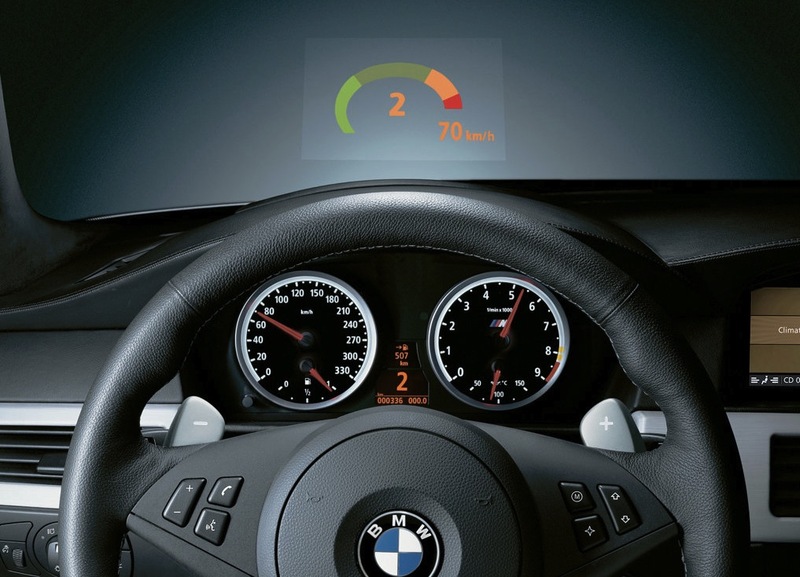 What kind of stability control system is fitted to the E60 M5 sedan and E61 M5 Touring? The E60 M5 sedan and E61 M5 Touring are both equipped with an advanced Dynamic Stability Control system jointly developed by Teves and BMW. In addition to being able to reduce engine power and/or apply braking force to any single wheel, this iteration of DSC also incorporates the following upgrades over a similar system used in the earlier E39 M5: Brake Standby (which prepares for hard braking by pressuring the pad up against the rotor when the driver abruptly reduces throttle), Brake Drying (which pressures the pad up against the rotor when the rain sensor detects moisture in order to keep the brake pads dry), and Start-Off Assistant (which holds the brakes for one second after the driver's foot is removed from the brake pedal in uphill conditions). DSC can be completely disabled* or switched into M Dynamic Mode (MDM), which raises the threshold at which the system will engage. The DSC system is designed to work in concert with the standard M Variable Differential Lock. *NOTE: DSC could not be completely disabled on E60 M5s equipped with the manual gearbox that were produced before September of 2007. However, customers of these early manual-transmission M5s could later request a free software update that enabled the option of complete DSC deactivation. How does the suspension of the E60 M5 sedan and E61 M5 Touring differ from that of the standard 5 Series? —Electronic Damping Control (EDC), which provides constant variation of the shock stiffness depending on road conditions and also allows the driver to choose from three shock programs: Comfort, Normal and Sport. 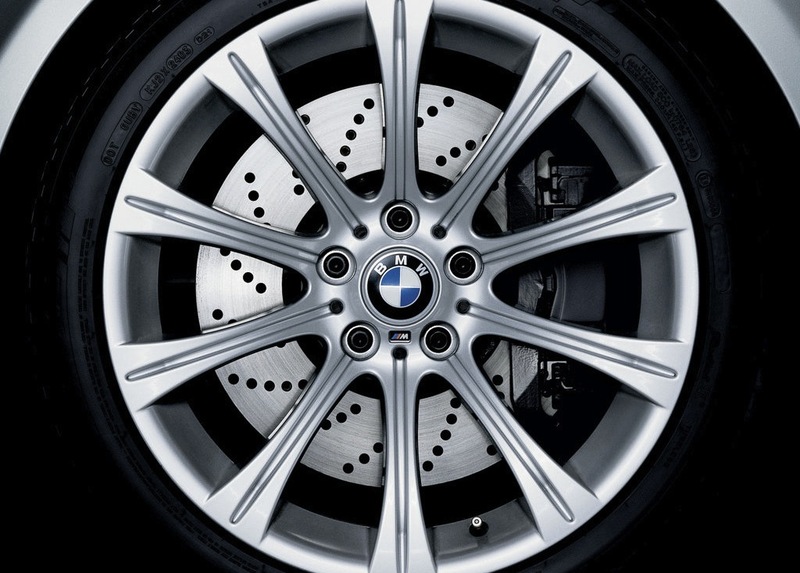 What type of braking system is used by the E60 M5 sedan and E61 M5 Touring? 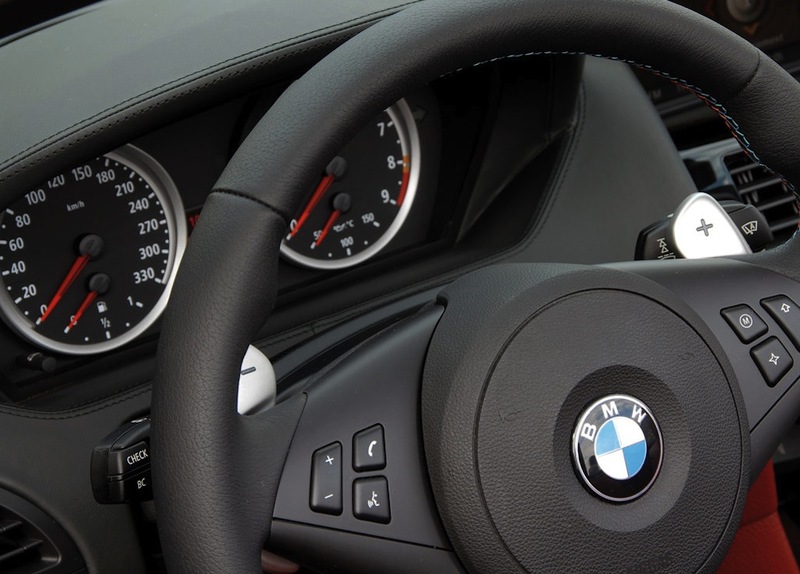 What type of steering system is used in the E60 M5 sedan and E61 M5 Touring? The E60 M5 sedan and E61 M5 Touring are equipped with a rack-and-pinion steering system with a ratio that varies depending on the amount of lock applied. The mean ratio for the system is 12.4:1. In addition, the steering is equipped with Servotronic variable power assistance that constantly varies the amount of assist based on vehicle speed. Two different parameters for the overall level of assist are offered, and these are linked to the three Electronic Damping Control (EDC) modes: Greater steering assistance is given when the EDC is set to Comfort mode and less steering assistance is provided in both EDC Normal and EDC Sport. 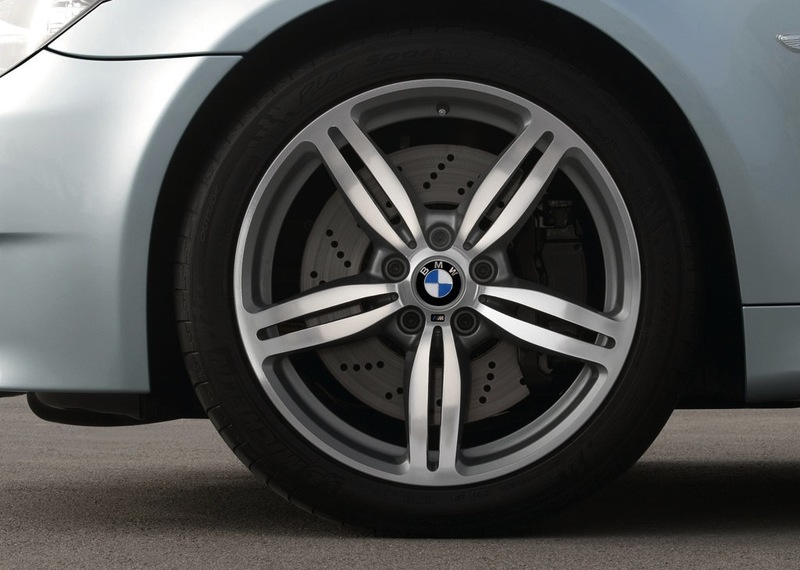 What are the factory wheel and tire sizes for the E60 M5 sedan and E61 M5 Touring? In some markets outside of North America, both the E60 M5 sedan and E61 M5 Touring were also offered (as an extra-cost option) with the forged and polished "Style 167M" alloy wheels similar to those used on the E63 M6 coupe and E64 M6 convertible. These also measure 8.5 x 19-inches in front and 9.5 x 19-inches in the rear. How do the exteriors of the E60 M5 sedan and E61 M5 Touring differ from those of a standard 5 Series? Unlike the E39 M5, which was largely indistinguishable from other 5 Series M Sport models, both the E60 M5 sedan and E61 M5 Touring were given fairly extensive styling revisions by BMW M GmbH. 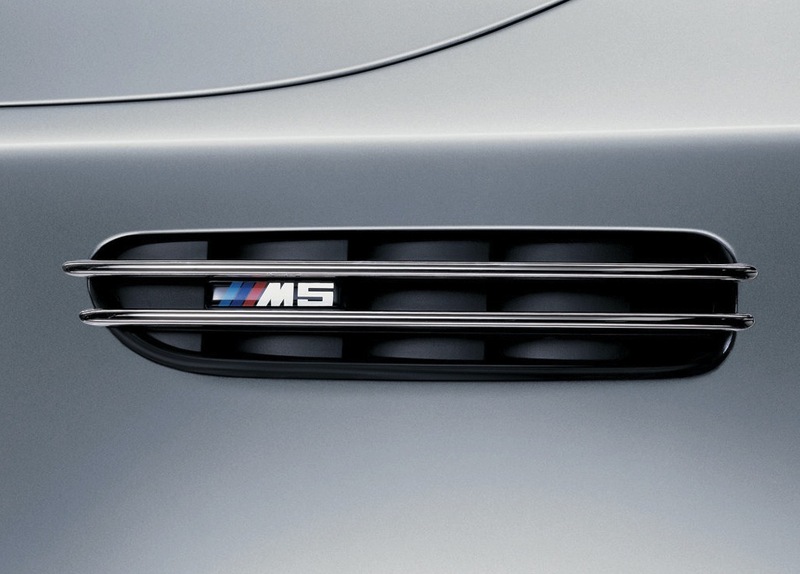 In addition to a totally unique front fascia design, which contains large air intakes in place of fog lights, the front fenders are significantly wider than those of other 5 Series and are fitted with decorative gills that display the "M5" logo. There are also unique rocker panels and M-designed side mirrors (with a black lower portion), as well as a much more aggressive rear bumper design that incorporates a central diffuser and flaps that wrap around each pair of dual exhaust tips. Finally, on the E60 M5 sedan, the area of the trunk lid around the license plate recess is subtly altered and there is a body-color lip spoiler attached to the trunk lid (which could be deleted as a no-cost option). How do the interiors of the E60 M5 sedan and E61 M5 Touring differ from those of a standard 5 Series? What types of seats were offered in the E60 M5 sedan and E61 M5 Touring? Two different front seat types (both heated) were offered in the E60 M5 sedan and E61 M5 Touring: standard M sport seats with power-adjustable side bolster width and optional M multifunction sport seats with active lower side bolsters that automatically tighten under lateral loads, active headrests, and independent power adjustment of the upper seat bolster (non-active). A third choice was later introduced as an extra-cost option for some markets beginning with the 2008 model year (3/2007 production): 20-way Comfort front seats with active upper bolsters (only offered in combination with ventilated seats and perforated Merino leather). 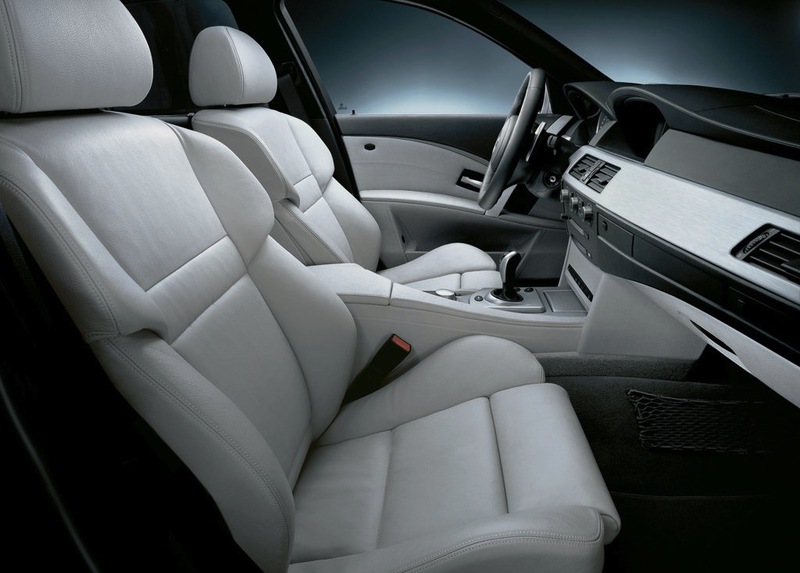 What types of leather upholstery were offered in the E60 M5 sedan and E61 M5 Touring? 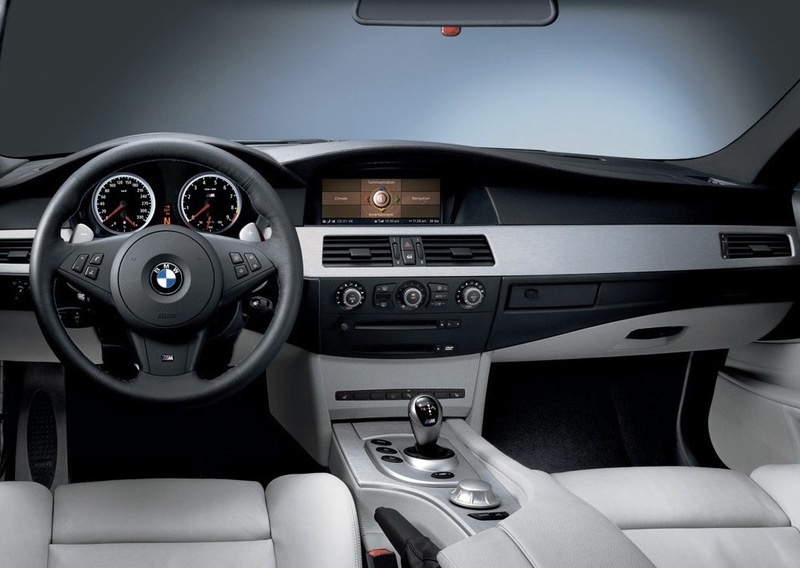 BMW M offered three types of leather upholstery in the E60 M5 sedan and E61 M5 Touring: extended Merino leather, complete Merino leather and complete Merino perforated leather. Extended Merino leather included leather only on the seats, central door panels (including armrests) and center armrest. It was available in three colors: Black, Silverstone II and Light Sepang Bronze. A complete Merino leather interior was offered as an extra-cost option and, in addition to the leather interior items included with the standard extended leather, added hide to the following areas: upper dashboard (including instrument panel cover), lower dashboard (including glovebox door), upper door panels, lower door panels and entire center console. Comlpete Merino leather was offered in a choice of five colors: Black, Silverstone II, Light Sepang Bronze, Indianapolis Red and Portland Brown. A variation of complete Merino leather with perforations in portions of the front seats was included on all M5s equipped with the available ventilated (cooling) seat option, however this was offered only in Black, Silverstone II and Light Sepang Bronze color choices. 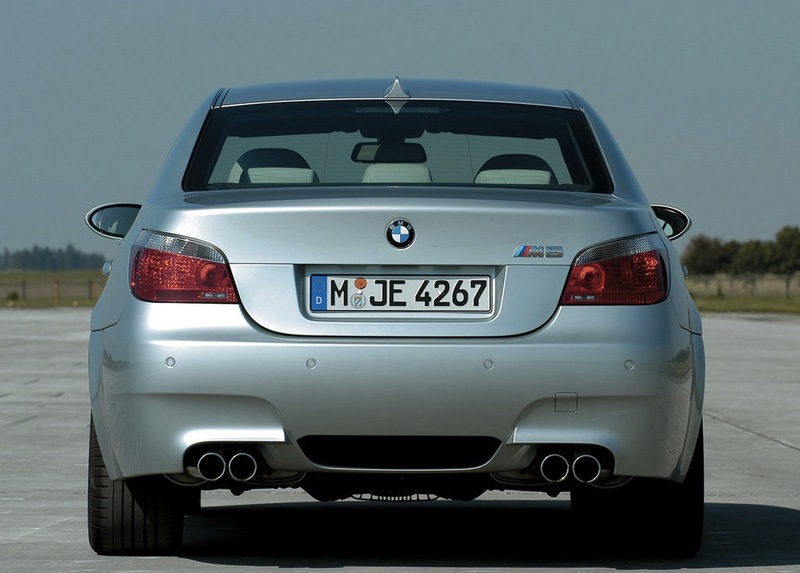 Were there any official special editions of the E60 M5 sedan and E61 M5 Touring? BMW M GmbH produced one official special edition of both the E60 M5 sedan and E61 M5 Touring in order to commemorate the 25th anniversary of the M5 range. However, this model should not be confused with the 580-hp E60 M5 CSL, a unique one-off prototype that was also unveiled in honor of the M5's 25th birthday. Equipped with a special 5.5-liter version of the S85 V10 motor mated to a 7-speed M Double Clutch Transmission (M-DCT). the M5 CSL was lighter than a standard M5 by 50 kg (110 pounds) and featured a carbon fiber roof, lightweight racing seats and bold M tri-color striping. It was reportedly 20 seconds faster than a standard E60 M5 around the Nürburgring. What distinguishes the "25th Anniversary Edition" E60 M5 sedan and E61 M5 Touring? 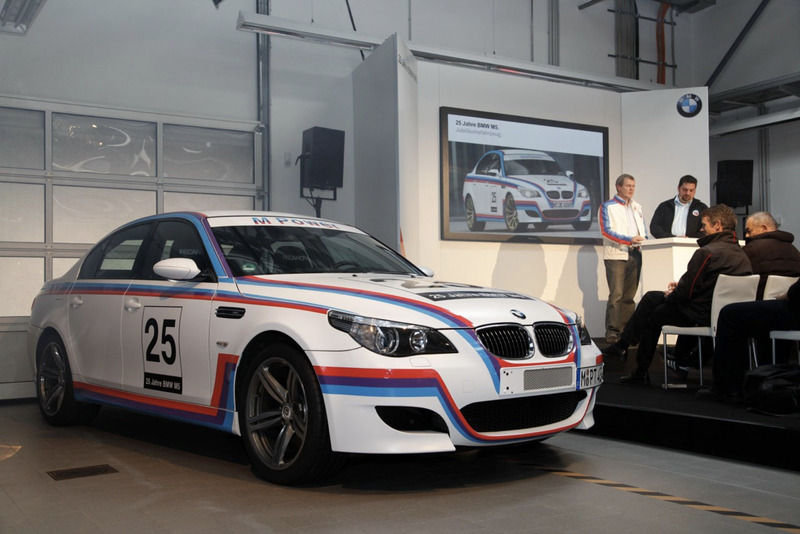 In order to celebrate 25 years of the M5, BMW M GmbH offered a special edition of the E60 M5 sedan and E61 M5 Touring. 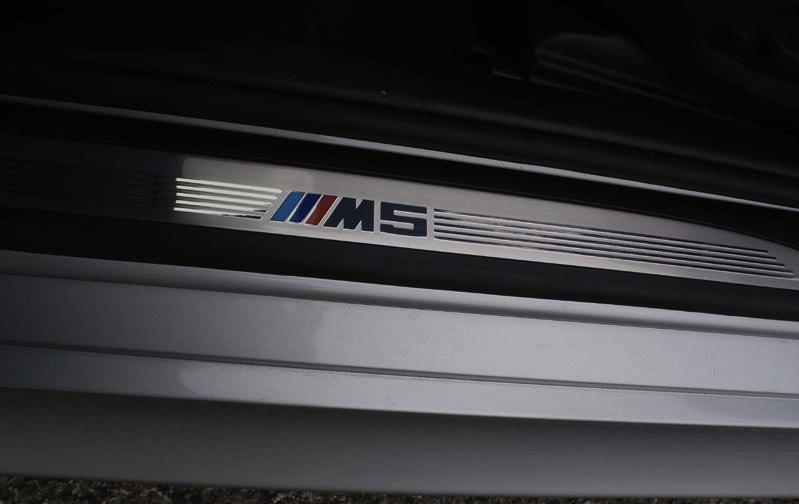 Each was painted in matte Frozen Grey paint from the BMW Individual program and also fitted with a special set of door sill plates bearing the inscription "25th Anniversary M5". With the exception of UK-spec examples, which featured a standard Black complete Merino leather interior, the 25th Anniversary Edition M5 was offered with a choice of two unique BMW Individual upholstery configurations: Black complete Merino leather with Light Grey contrast stitching or Bi-Color Black + Silverstone complete Merino leather with Light Grey contrast stitching. 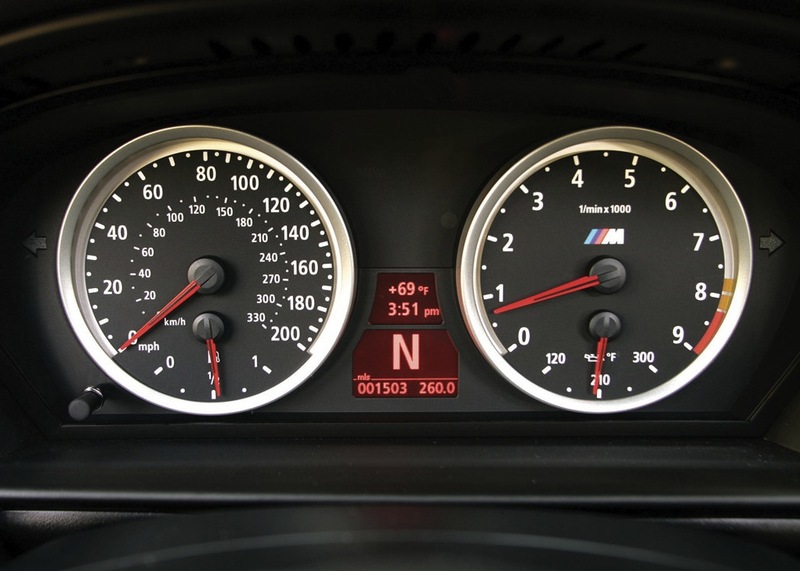 Mechanically, however, the cars remained completely unaltered from the standard M5. A total of 27 examples of the "25th Anniversary Edition" M5 were produced during late November and early December of 2009. The limited edition run was comprised of 13 left-hand drive sedans (eight for Germany and five for Brazil), 11 right-hand drive sedans (ten for Great Britain and one for Australia) and 3 left-hand drive Tourings (two for Germany and one for Switzerland).